Zeroshulk is one of the well-known discount broker based out of Chandigarh. 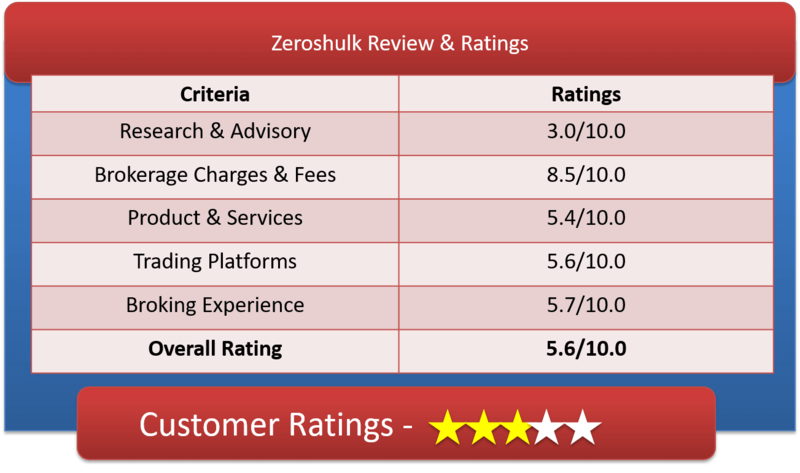 Let us have a detailed Zeroshulk Review & get good understanding of Zeroshulk Brokerage Charges, Zeroshulk Demat Account, Trading Platforms & more. Zeroshulk, started off under the banner V. Kumar & Co. back in 1985 and re-named the business to Zeroshulk Finance & Investment Pvt Ltd in 1996. Earlier it was known as Vikson Securities and has been in business for more than 30 years. In the last three decades, the discount broker has gone through various business transitions. But it gained the power after it marked its presence into commodities market in year 2003. In the year 2008, it achieved its membership of MCX stock exchange. Zeroshulk offers low brokerage rate and zero account opening charges and zero charges for the first year of annual maintenance fee. Although, it claims to be in the business for 3 decades but it has failed to acquire enough number of clients as it has around 2000 plus active clients these days as per records. Nowadays, it also allows you to trade in various market segments like equity, commodity, fixed deposits, insurance and few more. It provides excellent trading platforms and uninterrupted trading and support services. Also provides a range of other tools that can help you improve your trading performance and make the maximum profits with minimal risks. Their energetic and intelligent team is organized by only two people but with the knowledge & experience that cannot be measured just by a headcount. Also, they always interact with the media and taking questions and feedback from the customers and then incorporate them in business practices. Like most of the discount broker, zeroshulk charges flat brokerage per transaction. The Flat brokerage charge is Rs.15 per transaction. The brokerage house also has monthly brokerage plan. Charges like Transaction charges, STT, Turnover charges & others are very small in amount & doesn’t affect the overall ROI. AMC Charges: Demat Rs 300 per year (Free for first year only), 750 for five years, 1420 for lifetime. For Commodity – Zero Charge (AMC Rs 300 from second year). These are the list of Offers published by the broking house. How to Open Demat Account with Zeroshulk? This entire process takes 5 days to complete. Zeroshulk offers do it yourself account opening process. Why Open Zeroshulk Trading Account? Allows investment in other asset classes like Mutual Funds, IPO, Bonds, etc. List of Products & Services offered are listed below. Find the list of all details related to zeroshulk stock tips, research & recommendations. Zeroshulk provides Trading platforms for all types of devices & browsers. Let’s have a look at the various features & application of these trading platforms. Very secure app and easy to use and understand. The connectivity and speed of the app is very strong and is good for trading. You can download this app from the website or play store now. Easy to trade and modify the trading window that suits your needs. Good graphical representation for analysis market fluctuation. High speed platform and user friendly interface. Helps you get connected with multiple stocks and several other tools required for trading using web-trading toggles by stock broking house. Find the list of complaints lodged against the broking house & resolved accordingly. The Discount broker try to resolve any kind of client complaint within 7 days. But they end up taking more than 20-25 days, their feedback team doesn’t seem to be very proactive. Zeroshulk is quite an old investment house but their growth hasn’t been very good over the past years. The customer rating of the broking company is 5.6 of 10. Our critical experience into stock broking suggests that go with Zeroshulk if you have a good trading knowledge.